9 Smoking in public places is not allowed. "Thanks to generous government susidies, rail travel in Portugal is often cheaper and faster than travel by bus." I am portuguese and do believe that claim to only be true when not travelling by rail out of suburban areas. I.e., if you want to go from Lisbon to Coimbra, it'd be cheaper by bus than by train. Along the line between Braga and Faro, passing through Porto, Aveiro, Coimbra, Lisbon and Setubal, the trains are excellent but the fares are slightly more expensive than the bus fares. I agree this is definitely not true--at least for the major routes from Lisboa to Faro, Coimbra, Porto, etc. the bus is always cheaper. I think three people is enough to change this. Update: I wrote the first line (along the line between Braga...). Usually when trains are good, the train is a bit more expensive than the bus. This is what it was happening. However, given the recent records in oil prices, the train between Lisbon-Algarve is again a bit cheaper than the bus (even the excellent Alfa-Pendular train). I concur to that. Trains are somewhat more expensive, take longer (like 1h50 vs 1h20) and have less destinations than buses, but are slightly more comfortable and less tiresome. The "Vinho Verde" is not made from grapes that aren't mature. That is a myth. I live in the region (Guimarães) and have participated in some harvests and I can assure that the grapes are fully developed and matured as with any other wine. The name "Vinho Verde" comes from the sparkling, fresh nature of the wine. What about the Azores and Madeira archipelagos? Not only are they beautyfull destinations but they are also regions of Portugal. Why aren't they mentioned in the article or displayed in the map? Also, both Madeira and the Azores are quite humid and green. Only the island of Porto Santo is dry. Portugal's regions seems to be in a bit of a mess. 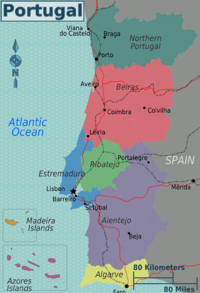 There are regions articles for Central Portugal, Northern Portugal and others that are not linked from Portugal and those contain some of the same links that appear under Portugal#Regions. I regret to tell you that Bairrada is not in the Lisbon Region, but a few km from Coimbra. And that San Rafael with a Spanish spelling seems to be near San Francisco, USA; I don't know of any São Rafael in the Algarve which might be more noticeable and well known than, say, Sagres. I also would have strong doubts to file the Alentejo as Central Portugal, but the classification, NUTS or not, seems to be a mixup of traditional divisions (those people know) and artificial ones. I love how this stuff happens. I once was commissioned to get photos for a brochure; we went around all the publications for a given region, and all of them mentioned the important Pelourinho in a certain town. We went to that town looking for the Pelourinho and it had been taken down and removed about 45-50 years ago, but none of the travel writers had checked it in reality, they just copied each other's. But the Pelourinho was certainly well referenced, eh eh. I would propose Braga and Guimarães for removal, eventually also Aveiro and Viseu. They are certainly important historically, but aren't worth a detour, as reading about them is certainly enough. I mean by that that what's there is also almost anywhere else, if by another, less magnificent designation, well maybe the Sameiro near Braga if you want. The possible exceptions are the Aveiro region (the museum and the Costa Nova typical architectura are cute) or the Grão Vasco Museum at Viseu if you like ancient art enough. "Southeast Portugal is connected by international train (linha do Leste and linha de Caceres) [Elvas/Caia,Portugal & Bagajoz,Spain] or [Marvao-Beira, Portugal & Valencia de Alcantara, Spain.]" Simply not true. The track is there but passenger trains stop at Évora or Beja. That's what you get by reading "references" from armchair tourists instead of going there. Smoking in public places is not allowed. This is incorrect. It is forbidden, and subject to a fine, to smoke in public enclosed spaces. By closed, according to the law, it is meant anything with a cover and two or more walls (a rudimentary shelter). It doesn't apply, say, to a train station platform with a cover and a single wall. In restauration and hotelry it is allowed to have smokers' bedrooms and smokers' designated areas. These depend on details such as minimum and maximum surface, ventilation and clear separation, which are sometimes difficult to implement by the owners. Small surfaces can opt for smokers or non smokers on all the surface provided ventilation is adequate. The presence of "No Smokers" and "Smokers" sign is mandatory and its absence is subject to a fine. Almost all fines regarding the application of the law have resulted from the absence of "No Smokers" signs. The law is being very well adhered to. I find it odd that in the Stay Safe section two references popped up picturing gipsies and only gipsies as evildoers. Further ahead the maximum ATM withdrawal is referred to as being 500 euros, which is untrue -- it's 2x200 euros (400 euros). Some ill informed person(s) are going about the page. You're right, many gipsies are a problem, in more than one way; but as you mention, they aren't the only ones; plain whites do it, blacks do it, indians do it, chinese do it (as you mention). I really don't care about political correcteness (duh) and I still like to call things by their names (reason why I titled this "Xenophobia? ", question mark); but being unfair/partial/erroneous is another stuff, I think. It would be terrible to make people think that they're safe provided there are no gipsies around or something. Personally I get much more nervous when I see a gang of youngsters of any ethnic group, for instance, and maybe anyone in Lisbon and around it has been harassed or robbed by second grade young people and developed strategies to cope with it, and they usually work fine. "Portugal is generally a safe country to travel, except when driving or crossing the streets. Driving is reckless. Do not rent a car or take coaches as sadly, road accidents are an integral part of daily life on Portuguese roads." Really? Crossing the streets in the cities is easier than in many European countries (drivers seemed quicker to stop for pedestrians than I've experienced elsewhere), and driving, especially on the nice new toll highways, is very easy. And advising the traveler to not take a coach? Ridiculous! I don't know if this was written as a prank or by someone with a phobia of cars, but it gives the reader entirely the wrong impression. [Other Portuguese cities often have] insane round-abouts which requires confident driving to get through and out safely. In most cities, the lack of indication signals makes it an adventure strictly for locals. You can see your destination and still be unable to get there. Parking legally is very difficult if not impossible. what's insane about round-abouts, and how it affects safety? what indication signals are meant here? what exactly does 'makes it an adventure strictly for locals' imply? what prevents from getting to destination one can see? Article 9 of Act 23/2007 (4 July 2007) of the Portuguese Republic says that the travel document of non-Portuguese citizens "must bear a validity date which supersedes the duration of the stay". Day 2 - Day trip to Braga & Guimaraes. Train to Braga and bus to see Bom - Jesus Bus to Guimaraes next to see the castle and old town. If you have a car, sunset at mount penya would be nice I imagine. Day 3 - Cruise to alta douro. cruises were not running when i was there, but if pressed for time, you can do a train trip to Pinhao or Regua. (approx 2h each way). There are also afternoon cruises between Pinhao and Regua. Thus you can combine it with a train trip to Regua, then a cruise to Pinhao, which is the nice part in my opinion. Day 6 - Lisbon, recommend travellers house. Time your visit in lisbon for the weekend is ideal for the nightlife. Otherwise, visit the castle, alfema area, belem and possibly one of the many museums/parks. Day 7 - Day trip to Evora Chapel of bones, walled village. Roasted black pork cheeks are superb. Day 10 - Faro - Depending on flight time. Extra time while waiting for the flight can be spent at the Faro beach which is few minutes only by bus that conveniently passes the airport. This page was last edited on 9 January 2019, at 20:25.